2015 brought me good fortune and even greater photos. My camera followed me from New Years Eve with my family in New Jersey then back to Korea before enjoying Lunar New Year in Thailand and short stint in Taiwan for Buddha’s Birthday. Then we went up a few Korean mountains and swam in stunning Korean islands before heading back to Thailand and then finally Cambodia before settling home in Korea. I’ve made amazing new friends, met the most wonderful woman and had countless adventures with what seemed like an endless hard drive full of photos. Sifting through was no easy task and at first glance I had over 200 favorites! To see them all find me on Instagram @LiveTravelTeach but I guess I should just cut to the chase cause here at my top 10 travel photos of 2015! I like to call #5 Stormy Angkor since it comes from Angkor Wat. 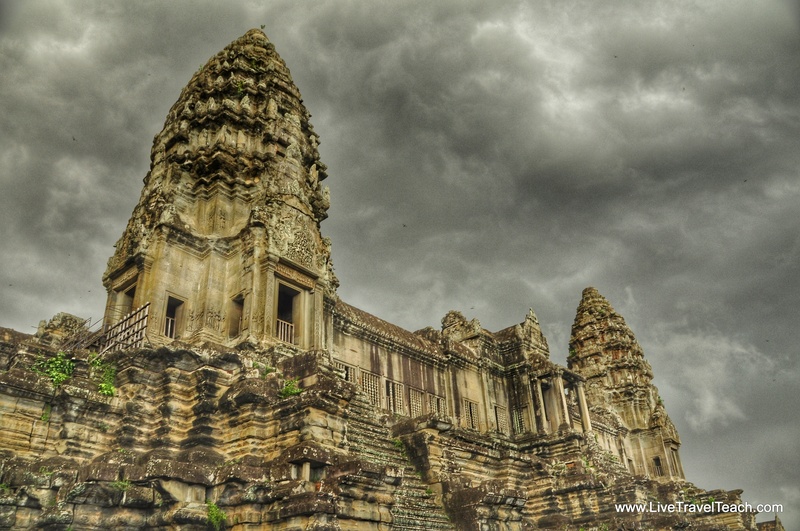 One of the days I toured this fabulous temple complex we were graced with a magnificent storm. Perhaps Siem Reap’s landmark’s should be renamed Angkor Wet in August but either way it provided me the opportunity to take this contrasting photo with a gloomy background. Hope you’re enjoying this series. Come back tomorrow for #4! Check out # 6 here!